You’ve spent three years at your company. You like it, you’re doing well and you’re starting to feel confident. Not “tell-your-boss-off confident” or “show-up-three-hours-late confident,” but you’re feeling pretty good. One day, your boss gives you the responsibility to choose a marketing automation solution. You have a budget of $25,000 per quarter. Do you simply do a Google search and pick the first company that shows up? Do you choose the first company that makes you an offer? Do you skimp on researching and reading reviews? If you’re nodding yes to all of these, then you’re lying. Or you’re an idiot, and how do you even have a job, again? You’re going to do research. Your research will involve LOTS of written and visual content, and you’re going to soak it up like a sponge. Whenever you’re making a big decision that has your reputation or your own money on the line, you’re not going to blindly agree or purchase. Your target audience isn’t going to choose a partner on a whim either. They likely need you to serve them various touch points within the buyer journey before committing. Before altering or creating a marketing strategy, first analyze the data you have available. 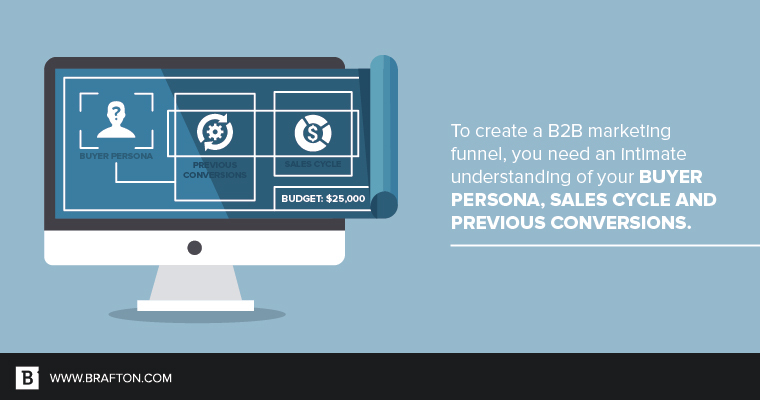 To create a marketing funnel, you need an intimate understanding of your buyer persona, sales cycle and previous conversions. Thankfully, you can use your CRM and Google Analytics to gain insights. Buyer personas need to be based on real data, not assumptions. If you haven’t developed personas, you can gather data from Google Analytics and your CRM to understand your current audience. To make the most of Google Analytics, ensure your conversions are being tracked as goals. If they’re not being tracked, you will only have a picture of your website visitors – not your converters. In Google Analytics, start by adding an advanced segment that solely includes data from those who Converted (Goal Completions > 0 and Transactions > 0). 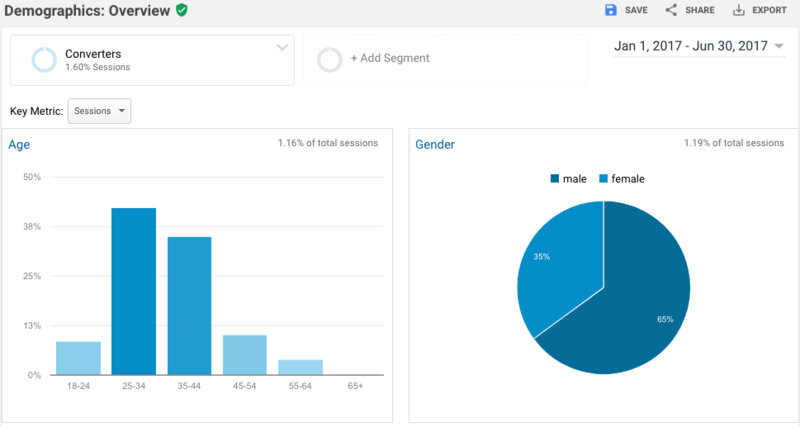 Use Audience reports such as Demographics and Geo to understand characteristics of previous converters. Use the Mobile report to understand which devices your converters are using. Next, navigate to the Conversions section in Google Analytics. View the Reverse Goal Path report (found under Goals) to understand what pages users were viewing before converting – was it a particular case study or a specific service page? View the Multi-Channel Funnels reports (also located under Conversions) report to understand how different channels are contributing to conversions. Viewing the Top Conversion Paths report will highlight common paths users are taking before conversion. If 90% of converters are originally discovering the site via organic search but don’t convert until being served a remarketing ad on social, you can get an idea of what’s working. Time Lag and Page Length reports explain how long it took for visitors to convert, which gives you an understanding of how much time and content was needed before users felt confident enough to outwardly express interest. Next, move to your CRM to discover the types of individuals involved in making the decision to purchase your service/product. How long did it take to close the sale? As your industry and services evolve, you’ll want to revisit your buyer personas on an ongoing basis to understand what may have changed. Is the responsibility for purchasing what you offer now tasked to a CFO instead of a CEO? Learn what types of meetings typically need to happen for a sale to close. I find it incredibly insightful when clients provide a list of the top companies they’d like to work with, similar to an account-based marketing approach. That allows us to research the org structure and influencers on LinkedIn, and start to get an idea of who could be involved in making the purchase decision. Who do we need to attract? Are we looking at CEOs or individual contributors? How does content marketing fit into the buyer journey? At Brafton, we create content for each part of the funnel. Whether your sales cycle is two days or two years, content in a variety of forms is used to attract, convert, close and delight. According to a survey from Content Marketing Institute in 2017, 92 percent of businesses view content as a business asset. Content marketing is proven to attract new users, build trust, aid in conversion and drive users from conversion to purchase. Which type of content is good for each stage of the funnel? To attract new users, content needs to be focused on the problem users are experiencing and should answer questions that users are asking. Content should then be distributed via social media channels. At this point, users are still in the awareness phase and aren’t interested in being sold to any more than you’d like a random guy chatting you up at the bar. To convert visitors, use downloadable assets gated behind a conversion landing page. Gated content needs to provide new information that users could not have found elsewhere. At this point, users know what their problem is and are actively looking for ways to solve it. B2B companies with long sales cycles know that users don’t convert right away. Email marketing & drip campaigns. Email campaigns should be personalized. Provide users with content relevant to the asset they originally engaged with. Based on your knowledge of your target audience and the buyer journey, what needs to happen for them to become confident in my services? What do they need to present internally to move forward? Ensure you have shareable content to aid the prospect as they move forward with internal conversations. To close the deal, case studies and testimonials are the best way to show proof of concept. Video testimonials are especially powerful, as they show just how delighted and committed your clients are to show off your services. Connecting prospects with brand advocates increases their confidence that you offer the solution to their problems. Next time you’re tasked with a big decision at work, or the equally stressful purchase of a new TV, notice the steps you go through. Consumers, regardless of industry, all need the same things: proof of concept, easily accessible information and a sense of trust. Content provides all of the above. Christina Mowry is a Content Marketing Strategist at Brafton. When she's not creating and reporting on strategies for her clients, she's probably watching The Office on repeat and counting down the days until the Patriots play again.